FILE - Traffic moves besides the Saigon river during rush hour in Ho Chi Minh City, Vietnam, Nov. 18, 2015. Senior officials warn air pollution levels in Ho Chi Minh City and Hanoi alone could soon match the deteriorating air quality of Beijing. Vietnam’s fast-growing economy, even as global trade slows, has been hailed as a success story in Asia. But experts say the nation's rapid growth is coming at a rising cost to the environment. Senior Vietnam officials are warning air pollution levels in Hanoi and Ho Chi Minh City alone could soon match the deteriorating air quality of Beijing. And the Asian Development Bank (ADB) has warned Vietnam’s rapid industrial growth means that “absolute levels of land, water, and air pollution” are rapidly increasing. In a study covering 2011 to 2015, Vietnam’s environment ministry revealed a deterioration in air quality in many urban areas, especially the capital Hanoi and Ha Long as well as Ho Chi Minh City. Chief concern is rising concentrations of nitrogen dioxide (NO2); in Hanoi NO2 was measured at up to 1.3 times above permitted levels, and in Ha Long by 1.2 times above. In Ho Chi Minh City, the commercial capital of the south, it was reported at twice the permitted levels. Nitrogen dioxide is especially harmful for children and elderly, because of their weaker lungs, leading bronchitis and other respiratory problems. The deputy director of Vietnam’s Environment Administration, Hoang Duong Tung, told local media that traffic and industrial activities were the main cause of air pollution in Hanoi and Ho Chi Minh City. In Ha Long, the problem was coal mining and power plants. Vietnam’s growing wealth means more people can afford to buy cars and motorbikes. Hanoi traffic police say an average of 19,000 new private vehicles are registered each month. A 2013 National Environment Report showed air pollution in Hanoi over 265 days of the year air quality was graded from “unhealthy” to “hazardous”. Pollution is beginning to affect livelihoods. In April, fishing communities angrily protested when more than 100 tons of dead fish were found off the coast of four central provinces. 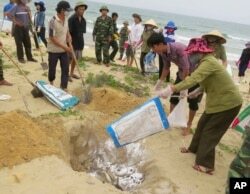 FILE - Villagers bury dead fish on a beach in Quang Binh, Vietnam, April 28, 2016. Vietnam's government found Taiwan's Formosa Ha Tinh Steel Corp responsible for a toxic wastewater spill causing massive economic and environmental damage. Investigations found Taiwan-owned steel plant, Formosa Ha Tinh, was the source of a toxic wastewater discharge. In June the company accepted full responsibility and pledged to pay $500 million in damages. Prime Minister Nguyen Xuan Phuc recently issued an official order for the compensation to the victims of the pollution to be paid by the company. The government said the funds - ranging between $130 and $1,600 per person - began arriving this month. But a Vietnamese court rejected hundreds of law suits filed by the fishermen who sought additional payment from the plant. Jonathan London, a lecturer of global political economy at Leiden University in the Netherlands, says Vietnam’s increasingly “free-wheeling economy” raises concerns over the environmental impact. London said the outcomes of this strategy had not always been successful, including when it comes to environmental protection, and he pointed to the Formosa Ha Tinh plant wastewater discharge as an example. The government under its long-term planning (2011-2020) has set environmental sustainability among other goals of structural reforms, social equity, and macroeconomic stability. 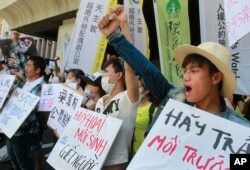 FILE - Vietnamese activists shout slogans and hold placards during a protest to urge Taiwan-owned steel plant Formosa Ha Tinh to take responsibilitiy for the clean-up of its toxic wastewater spill in Vietnam, in Taipei, Taiwan, Aug. 10, 2016. Xavier Depouilly, the general manager for the firm Indochina Research, says the deteriorating environmental conditions are just one of several challenges facing the government. “Up to now it’s all OK. People have food to eat, something to drink. But other issues, such as pollution – this is making the population very serious (angry). To some extent, the government has more to improve on that level,” Depouilly said. Still, Vietnam’s economic outlook remains positive for foreign investors. Economists with the London group Capital Economics estimate Vietnam’s economic growth rate, which slowed from 6.7 percent in 2015 to 6 percent this year, is set to rebound to 7 percent next year. “Looking ahead, we think Vietnam will quickly regain its position as one of the fastest growing economies in the region,” said Gareth Leather, senior Asia economist with Capital Economics. The government says in 2015, foreign direct investment into Vietnam rose 12.5 percent to $22.8 billion. In the coming years, more investment is expected from China, as businesses seek cheaper alternatives to China's rising business costs. The leading foreign investors include South Korea, Malaysia, Japan, the United Kingdom and Taiwan.